Almost as long as I have been crocheting, me and my buddy, A Bunch of Buttons have talked about selling our cute little crochet gifts. Nothing too fancy, just some of our toys, maybe some hair clips, yarn bowls or the such like. Not because we expect to make a profit you understand, but really to recoup a little money to fund our insatiable yarn habits. We've planned stall names, stall styling, prices and packaging. Unbeknownst to her, I've taken this a step further. I've carefully selected a handful of local craft fairs and enquired about the possibility of a stall. One even said yes! (I sent pictures, it was the kangaroo that really nailed it). Naturally, it was only right for me to scope said fair out. They want us, but do we want them?! So last weekend Coop and I did our best stealthy spy impressions and headed over to the craft barn to work out if it was for us. Coop was immediately distracted by the handmade chocolate muffins for sale just inside the doorway whilst I wandered around surveying not only the products on offer but everything else too. The way the items were displayed, how the prices were shown and what were they, how they packaged the sold items. It was a real mixed bag, some modern, some more let's say 'traditional' items (you know the kind of thing I'm talking about, like what my grandma made for me 20 something years ago) and a whole bunch of handmade soap. One stall particularly attracted my attention. 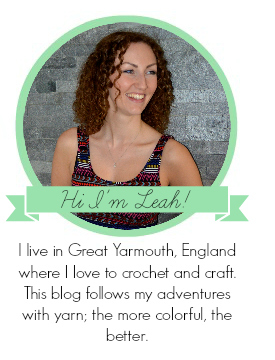 A modern local knitter who made home items with lovely patterned yarn. I instantly noticed sweet-looking capital letter cushions and knew I had to have one. That was until I noticed the £35 price tag. Yep, £35! Now on one hand, I get it. To price up a handmade item, you've got to factor in a wage for yourself per hour, plus materials, stuffing; it all soon mounts up. But equally, I'm not sure I know too many people who are prepared to pay £35 for a cushion. There was really only one thing for it. I had to make one. So here it is an 'L' for Leah, or 'Love' if you're feeling particularly mushy. Initially, I toyed with the idea of designing an 'L' for myself. It's just two straight lines right? But then I saw this rather impressive letter on Ravelry and realised that if it didn't look like this, I'd be disappointed. I snapped up the pattern and set about making it from my favourite Debbie Bliss aran yarn. Basically you make the front and back 'L' and then create one long loop to make the 3D sides. At this very moment, I'd decided that there must be a mistake in the pattern because the loop was far too big. I counted it, and recounted it, but couldn't work out what had gone wrong. I also found it tricky to get it all lined up. Can you see all those stitch markers?! This was just a few of what I needed to try and secure the purple band in place to make sure I had enough in the right places. Unsurprisingly, the pattern wasn't wrong. Once you wedged the purple into all the little nooks of the 'L' it soon fitted snugly. The finished cushion is just as good as the one I saw for £35 and cost me much less to make (if we don't think about the time it took to make, best just to gloss over this part). Here it is in it's new home on my craft room windowsill. Doesn't it look good there? On the craft fair front, it's a no go for now. The fair they had an opening for was this weekend (gulp). Not quite enough time to really pull everything together, but I'm glad to know that we're making the kind of things people want at craft fairs and I'm sure as we head towards Christmas, more opportunities will come our way. Have you ever sold your crafts at a fair? Do you have any tips?